In the start of the sever when you are asked to select a Cardinal Direction, players are essentially selecting a quadrant on the whole map. However, as per lengthy discussion with some other players it seems like despite selecting a quadrant you could land up anywhere in half of the map or 2 quadrants. My question is if this is right ? If so, then Travian Starting Cardinal direction where you select a quadrant is kinda misleading. Why? Can you guys please confirm how does this system works in travian and why is it misleading or not. Everyone else please feel free to chime in with your thoughts. Instead of having to spawn randomly and let RNG decide if you are lucky why not just allow players to drop their village on the map where they like it. Right now RNG controls these factors. 4. Closeness to WW./somewhat RNG, not completely to my understanding. They dont seem a lot at first, but they do add up really quickly. Menhir system is a good way to combat this but I think we need to push it futher. I would prefer if Travian was more like a game of chess, where player with superior moves wins, not player that got lucky on their map placements, adventures and card game. I'm no admin, but I can answer your question precisely: North / East / South / West do not correspond to one quadrant. In T:L and older you could choose between Northeast, Southeast, Northwest and Southwest (sorry if the names aren't accurate, I'm no native speaker) - those were the ones corresponding to the quadrants. North means basically "more in the positive y direction than in any x direction". East means "more in the positive x direction than in any y direction". South and west are analogue. The above picture is correct. But then comes the confusing part, after signing up, you will find out that the map looks different and North doesn't seem in the same place anymore. It is like when using a compass. It always points to the north, but when you rotate the compass, the north is no longer pointing upwards. But it is still north. When in doubt, use the coördinates of the WW as a reference. Robbel & Be2-e4 . My experience differs from what you are saying. Each time I have selected North I end up towards the -50/0 WW .. either a little bit or a lot to either the "left" or "right of the line drawn between the -50/0 and the 50/0 WW. Similarly, when selecting south I have in the past always ended up towards the 50/0 WW. So my conclusion was that the North/South axis was between these 2 WWs. Just to double check my past experiences I registered on COM4 and COM5 just now. I selected North. Here are the results. This means that you are placed in a "Half" of the map. The post was edited 3 times, last by Scorox ( Feb 8th 2019 ). Your tests confirm what Be2-e4 is saying. We did many tests last year choosing 'East' and we ended up in East (area 50/0), North East (+/+/ above ww 50/0) and South East (+/- below ww 50/0). No mate. Be2 wrote "North means basically "more in the positive y direction than in any x direction". This is not what I'm saying. What I'm saying is completely different. And you are saying: "And when you select North, you can end in all Northern places:" .... well yes this is what I'm saying. But the argument here is about where the North is. And to this point I wanted to prove you wrong. you also say: "We did many tests last year choosing 'East' and we ended up in East (area 50/0)" ... some times you will end up here according to my theory. But according to my experience this is still the "theoretical south". BUT, if you did in fact choose East and got placed in (+ X/- Y) .. then I am wrong I guess. According to my experience you should never get -Y selecting East. Robbel How do you explain than spawning near -50,0 after selecting North and never near 22,45 ? Be2-e4 I spawned at -38,-38 using North In a game world few days ago. That shouldn't be possible as per your theory. BridgetB Georgi Sheila some insight from you guys could help us save much time and efforts. The post was edited 2 times, last by ⭐Starx⭐ ( Feb 8th 2019 ). I just created three test accounts (in different worlds), which spawned on -46/37, -25/67 and -35/38. Either my initial post was slightly off and Kingdoms does take the map shift into account (contrary to T3.6 and before, in T:L there's no shift) and defines north as the actual definition of north (top of the map). This would mean, that north is -45° - 45° to 45° - 45° (usual definition + map shift) = -90° to 0°. 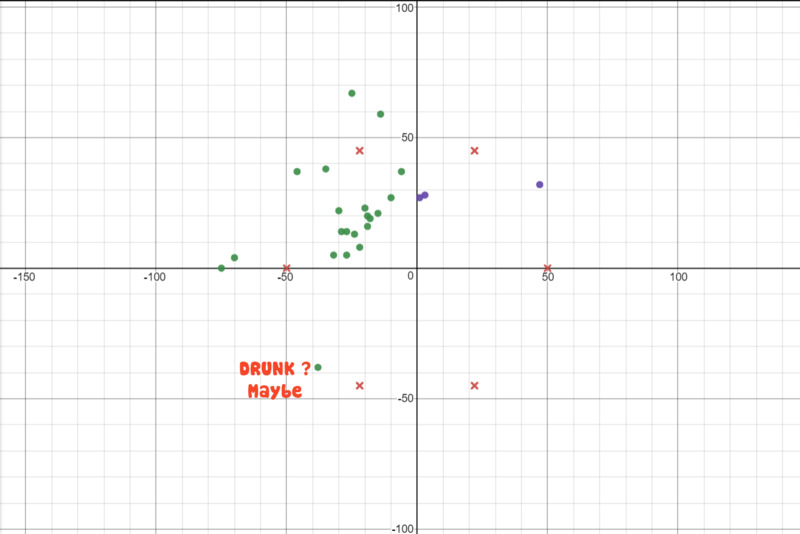 Which corresponds to the -/+ quadrant. The "direction selection"-UI implies this aswell and it aligns with normal definitions. E/S/W would be ++/+-/-- then, btw. Or my initial post was correct and Kingdoms just isn't very precise when placing you on the map (first and third coordinates are only slightly off my explaination and the second one matches, a sloppy calculation would explain this). But really no clue how you landed on -38/-38, maybe you missed to switch the radio box (you can't select a direction when it's on random) or misclicked. But -38/-38 is, by any means and by any logical mathematical conclusion, definitely not north, lol. Maybe if one holds the map drunkenly. So we made several tests and following is the data collected from that. Thanks for sharing @Starx ! I still wonder though if there are some kind of "spill-over" mechanic that pushed some people choosing a certain quadrant over to the adjacent quadrant if the one they choose is to "full". This is at least what I remember happening on one server to the team I was in. Yes, the statement, that some players land up in one of two quadrants irritated me in my first post aswell. OP's graph confirms my second post nicely though. Or algorithm might be looking for a set of parameters before placing a village in selected quadrant. Like X minimum Y maximum distance from oasis, Z kingdoms nearby, N players nearby, and then searches for a spot with those parameters closest to the desired coordinates. So when the map expands no more people will be "spilled". I highly doubt that travian can have some sort of spill mechanism because it misleads players if they choose a quadrant and don't land in it. And I don't see any disclaimer either from travian saying that it might happen. But strange quite from Georgi , BridgetB and game designer Sheila In clarifying a very simple query is making me a bit of suspicious, but than again I might be paranoid. It is possible that this may be a new bug as a result of the new server mergers and whatnot......will definitely make starting the next round interesting when everyones start is a crapshoot on where they land. there was a big discussion regarding this topic in the past but unfortunately I'm unable to find it for few days now(will keep searching though). Additionally, there is no spill mechanism and you will always get spawned in the chosen quadrant, hope that helps!